Het was deze week 30 jaar geleden dat Ricardo Paletti verongelukte op Montreal. Was een heel triest ongeluk met een rijder die nog weinig plezier aan de F1 had beleefd. Although not having achieved much in the lower class racings, Paletti joined the uncompetitive team Osella in 1982. He admitted that Formula One struck him with a little bit of fear, but his sponsor wanted him to move up and Riccardo did not want to miss his opportunity. The sponsor was his father, Arietto Paletti, a rich Milanese businessman, who had made his fortune with a building company and importing Pioneer Hi-Fi equipment to Italy. Securing the second seat in the team had cost $1,000,000 and his teammate was the more experienced Frenchman Jean-Pierre Jarier. At least in one aspect Paletti was ahead of his time in F1 because he travelled with a personal medical adviser who was monitoring his blood pressure and heartbeat with small sensors attached to his body during testing and practice sessions. His diet was constantly adapted to the results. Few people took this professional approach seriously at the time. Making his first attempt during the South African Grand Prix in January 1982, Jean-Pierre Jarier managed to haul his Osella unit to qualify in the last position on the grid but Paletti was almost two seconds slower, failing to qualify. For the second round of the season, at the Jacarepagua circuit near Rio De Janeiro, the venue for the Brazilian Grand Prix, Paletti had to prequalify on Friday morning, but a wheel fell off the Osella after a suspension failure and again he didn't make the grid. The next round of the championship was the US GP West at the street circuit of Long Beach. Jarier found the right set-up for the Osella and managed to put the car in the top ten during qualifying. Paletti was a massive three and a half seconds slower than his experienced team mate and failed to qualify again. For the fourth Grand Prix of the season, at Imola on April 25, amidst a war between the FISA and FOCA, only 14 cars loyal to the organisation started the race. Paletti had managed to beat the ATS cars of Eliseo Salazar and Manfred Winkelhock and was supposed to start from the back of the grid. However, on Sunday afternoon Paletti failed to fire up the Osella for the warm-up lap and by the time he had left the pits the other cars were already lining up for the start. As a result, the moment he crossed the starting line he was already 49 seconds behind. He never even got close to the rest of the field and after seven laps he had to park his car due to another suspension failure. His Grand Prix debut had lasted a mere twelve minutes. At Zolder Paletti failed to prequalify on Friday, getting more and more disappointed with the Osella, and he was feeling intense rivalry with Jarier, who was more experienced and quicker behind the wheel. The new chassis, which was to be introduced at Monaco, gave some promise, but still Paletti knew that qualifying for Monaco was virtually impossible with only twenty entries allowed to start in the narrow streets of the principality. There was only one new monocoque for Jarier and the new rear suspension was delayed. Once again, Paletti failed to prequalify. 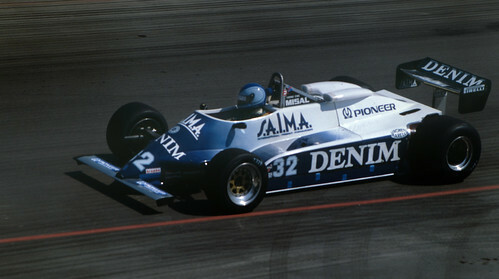 On his seventh Grand Prix, in Detroit, Paletti was suddenly much closer to Jarier's pace and, although the gap was still over a second, he qualified right behind his team mate. However, during the warm-up session Paletti lost a wheel at the beginning. The mechanics tried to repair the car in time for the race and, while there still was the possibility of starting the race in the spare car, that option went up in smoke as well, after Jarier's fire extinguisher had gone off accidentally. So it was Jarier who took the spare car, which was set up for him anyway. This meant it would be a race against time for Paletti's mechanics to set up the car and they were still busy when the rest of the field progressed to the grid. But just as the work was finished, with Paletti ready to get in the car, news broke that Jarier had hit the wall, damaged his car and was on his way back to the pits. So Paletti's car was ready for Jarier to jump in and start the race from the pit lane, leaving Paletti behind as a frustrated spectator once more. When he qualified for the Canadian Grand Prix on Sunday June 13, 1982, it was the first time Paletti would start successfully in a full line-up. At the start, the lights took an unusually long time to turn to green. During this time, Didier Pironi, who had the pole position, stalled the engine of his Ferrari. Pironi lifted his hand to signal the problem, but there was no action for signalling the yellow to abort the start. The lights switched to green and the other cars swerved across the track, trying to squeeze past Pironi's stationary car. Raul Boesel just clipped the back left of the Ferrari, spinning his March into the path of Eliseo Salazar and Jochen Mass. Salazar, Boesel and Mass suffered minor impacts but it looked as if everyone had passed the Ferrari without serious consequences. However, Paletti could not react in time and slammed into the rear of the stranded Ferrari at 180 km/h (around 110 mph), catapulting it into the path of Geoff Lees. The Osella's nose was crushed in severely. Due to the force of the severe impact, Paletti sustained heavy chest injuries and was lying unconscious in his car, wedged against the steering wheel. Didier Pironi and Sid Watkins, the FIA's head doctor, were on the scene to stabilise and assist Paletti. As Watkins climbed over the wreckage of the Osella, the petrol from the fuel tank ignited, enveloping the car in a wall of fire. When the fire was finally put out, the injured Paletti was without a pulse. It took the rescue workers 25 minutes to cut him out safely from his wrecked car, as the sparks caused by the cutting equipment threatened to re-ignite the petrol on the track. He was flown by a medical helicopter to the Royal Victoria Hospital, where he died soon after arriving. His mother was watching from the stands, where they were to celebrate his 24th birthday later that week. It is said that Paletti was heavily intoxicated from breathing in the exhausting foam used to contain the car fire, and that this could have been fatal given the chest injuries that made the respiration difficult. Paletti was the second fatality in Formula One that year. Just five weeks before, Gilles Villeneuve had a fatal crash during qualifying for the Belgian Grand Prix at Zolder. Paletti would be the last driver to die at a Grand Prix meeting for the next 12 years until the 1994 San Marino Grand Prix, which took the lives of Roland Ratzenberger during qualifying and triple world champion Ayrton Senna during the Grand Prix itself. As a tribute to the young Italian, the racetrack at Varano de' Melegari, in the province of Parma (northern Italy) is now called the Autodromo Riccardo Paletti. His body is buried in the Cimitero Maggiore di Milano.